Fr. Saji Pinarkayil, who has been associate pastor of Sacred Heart and St. Mary’s Knanaya Catholic parishes in Chicago, took charge as the pastor or vicar of the parish. New trustees took charge. Baby Karickal (coordinator), Jacob Vanchipurackal, Zachariah Chelackal, and Joby Oliyil. Junior Bible Quiz by Religious Education School. Bishop Mar Jacob Angadiath visited first communion students of the parish and offered mass for them. Fr. Saji Pinarkayil blessed new office rooms at Sacred Heart Church. Fundraising Program of the parish, “Show 2012” at Gateway Theater, Chicago to raise fund for the purchase of rectory. Knanaya Region Day Celebration in the parish. Start of weekday Holy Mass at 7:00 P.M.
Main Feast celebration of Sacred Heart in the parish. Bishop Mar Jacob Angadiath was main celebrant on June 1. First Holy Communion and Chrismation at the parish church. Beginning of weekly novena of St. Antony on Tuesdays after Holy Mass. Pilgrimage to Guadalupe, Mexico lead by Fr. Saji Pinarkayil. 35 people participated in the program. 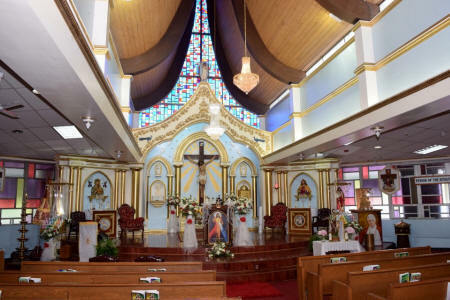 Sixth Anniversary Celebration of Sacred Heart Church. Knanaya Region Priests gathering with Mar Mathew Moolakkatt at Sacred Heart Church at 5:30 P.M. Blessing of the Shrine of the Most Sacred Heart of Jesus at Sacred Heart Church at 6:45 P.M. by His Grace Mar Mathew Moolakkatt in the presence of priests from Knanaya Catholic Region. Mar Mathew Moolakkatt inaugurated Malayalam Class at the church. Fr. Saji Pinarkayil inaugurated the Sixth Anniversary Celebrations of the parish. Inauguration of Year of Faith in the parish. First Forty Hour Adoration at the parish inaugurated by Bishop Mar Jacob Angadiath. Blessing of the rectory at Elmhurst by His Grace Mar Mathew Moolakkatt. “Year of Faith Bible Quiz 2013” for Religious Education School. Annual Lenten Retreat by Kulathuvayal Retreat Center team. Main Feast of Sacred Heart of Jesus. Main Celebrant on June 7th was Bishop Mar Jacob Angadiath. Religious Education Festival on June 7. Religious Education School Excursion to Shrine of Our Lady of Good Help, Champion, Wisconsin. Year of Faith conclusion service. Beginning of Divyakarunyanubhava varsham of the parish ending on December 24, 2014. Solemn Reception of Holy Communion and Chrismation. Main Celebrant: Bishop Mar Jacob Angadiath. Pilgrimage to Guadalupe Mexico by Sacred Heart and St. Mary’s parishes lead by Fr. Abraham Mutholath. Fundraising program of the parish “Ullasa Thiramala” at Evanston Township High School, Evanston. Main feast of the Most Sacred Heart of Jesus sponsored by Infant Jesus Koodarayogam and 10 other families. Religious Education Festival on June 6. Memorial Mass for Mr. Kurian Pinarkayil, father of Fr. Saji Pinarkayil, our vicar. Farewell to Fr. Saji Pinarkayil who is moving to Houston as Forane Vicar.